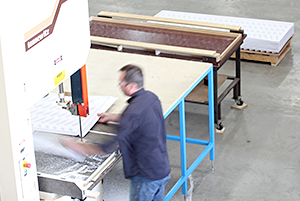 Thermoforming: the process in which a plastic sheet is heated above its glass transition state and formed over a mold. This process results in a stress free detailed plastic part that allows you the freedom of changing wall thicknesses and material properties without costly tooling changes. 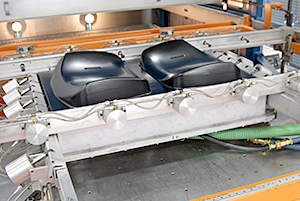 When compared with injection molding, thermoforming is a more financially viable alternative for larger, lower volume parts. 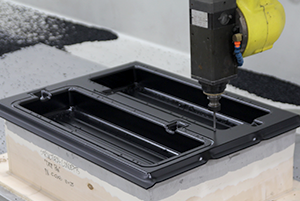 In addition to significantly reduced prototype and production tooling costs, thermoforming provides a much faster product development time. FSI processes most thermoplastic materials that are sheet extruded in thicknesses ranging from .04” to .50”. Vacuum forming is a type of thermoforming that forms a part by creating a vacuum between a heated layer of thermoplastic and a mold. The vacuum pulls the malleable plastic tightly over or into the mold, so that the resulting part be fully detailed. In pressure forming, we exert forced air pressure along with the vacuum force that is standard in thermoforming. 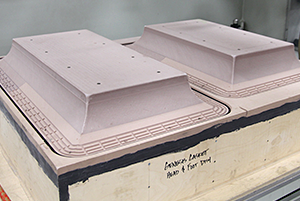 This type of thermoforming is ideal for parts with textured mold cavities and those that require a very high level of precision detailing and aesthetics. 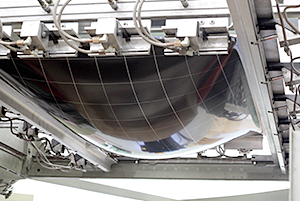 Compression thermoforming is the process typically used with composite thermoplastic laminates. This process consists of matched metal mold sets; compression forces for products with unique requirements.